To examine these largely unknown granular movements, academics from the Sydney Centre in Geomechanics and Mining Materials (SciGEM) including Professor of Civil Engineering, Itai Einav and Postdoctoral Research Associate, Dr. James Baker have developed a new X-ray method which allows scientists to see inside granular flows. 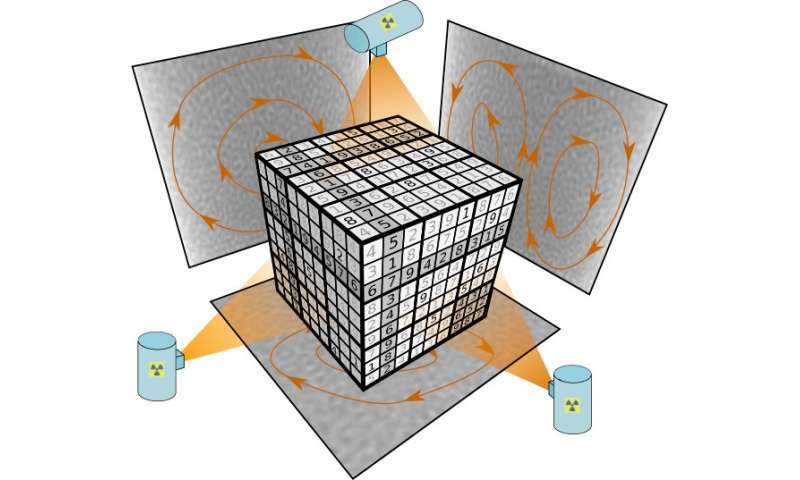 Named X-ray rheography, or "writing flow", their approach gathers information using 3-point high-speed radiography, and then assembles this information by solving a Sudoku-style puzzle. "Imagine coffee in grinders, rice in silos, and minerals on conveyors—for a long time we've known that the grains hidden within the bulk move, but until now we have not understood precisely how. Our X-ray rheography is the first physical method to resolve this," explained Professor Einav. "Until now, understanding granular movements in opaque materials has long been a challenge for many industries such as engineering, science, mining and even agriculture," explained Dr. James Baker. Professor Einav hopes that his team's creative approach in using a game of logic to answer a long misunderstood scientific issue may help rethink other research approaches, "We have successfully applied a novel approach to an ongoing issue—so we must ask how other games can help us make further breakthroughs?"